Whitewater rafting is a popular pastime in Bend, with several Wild and Scenic Rivers nearby that offer gentle Class I rapids to heart-pounding Class V rapids and everything in between. Our team of friendly, expert whitewater rafting guides provides high-adrenaline whitewater adventures and relaxing river floats in Oregon and Washington. Half and full day trips 30 minutes from Portland and near Mt Hood on the Clackamas River. Deschutes River, too. Plus 4 to 9 day trips on the John Day River. Our 35th year. Professionally guided river adventures from a few hours of splashy fun, to multiple-day wilderness getaways on a wide variety of rivers near Bend and around Oregon. 1 to 7 day rafting trips on the Deschutes, McKenzie, North Santiam and Owyhee rivers! Our seasoned, white water certified guides are knowledgeable, fun and down to earth. 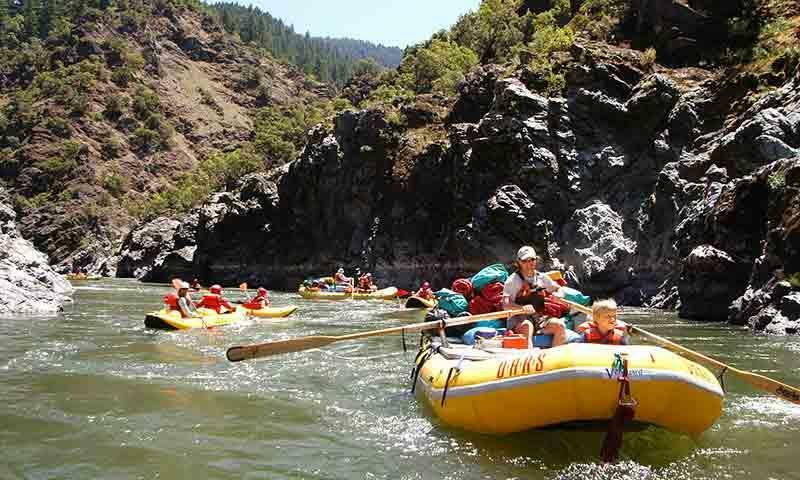 3 to 5 day adventure on the spectacular Wild and Scenic Rogue River. From scenic & whitewater rafting to kayak & SUP tours on area waters, our resort is the perfect home-base for adventure along the Deschutes River. Specializing in Fly Fishing on Oregon's McKenzie River. Fly Fisherman's Heaven! Trips Daily. All equipment provided. Rates from $199. Half Day. Comfortable driftboats. Enjoy half- and full-day whitewater trips around Bend, plus rental SUPs, SUP lessons, tubing on the Deschutes, Raft 'n Brew trips and much more. Fun for all ages. Experience Oregon’s high desert country during a whitewater trip on the Crooked River. Enjoy the beautiful fall colors during a September float trip on the Metolius River. Expert rafters can challenge their skills on the McKenzie River’s Class V runs. Hire a guide and take a whitewater rafting trip on the Wild and Scenic Deschutes River. One of the most popular activities in beautiful Central Oregon is whitewater rafting. Surrounded by several Wild and Scenic Rivers with excellent stretches of whitewater rapids, Bend, Oregon rafting attracts people from all over the country. Whether you choose to hire a Deschutes River white water rafting guide or head out on your own, whitewater rafting is an exciting way to enjoy nature and view some of the country’s most breathtaking scenery. Deschutes River – The Deschutes River whitewater rapids range from mild Class I to dangerous Class V, providing opportunities for novice and expert rafters alike. There are many different runs on this 250-mile long river that allow for short trips lasting a couple of hours, to lengthy trips lasting for several days. Hiring a professional guide who really knows the river is a great way to experience the thrill of a Deschutes River rafting excursion, especially if you’re new to the sport. McKenzie River – The McKenzie River, located west of Bend, flows through beautiful national forests and offers excellent whitewater rapids, many of which range from Class III to Class V.
Metolius River – There are some exciting Class II to Class III whitewater runs near Camp Sherman, northwest of Bend, that flow through beautiful forests. This river is especially beautiful to float in the early fall when the leaves of the vine maples are turning colors. Crooked River – There is a 17-mile stretch on this river that flows through the deep canyon walls of Central Oregon’s beautiful high desert country north of Bend. Those who raft it have to time it just right, as the waters are controlled by a dam and are often too low. But when the waters are high, it is definitely a trip worth taking. To get the most out of your whitewater rafting trip in Central Oregon, take some time to explore the various whitewater guides, tours, and outfitters located on this web page.